In this moment there are a large number of different types of brands and models of wireless presenters for PowerPoint. Which one should we choose? Which one is the best deal for our needs? To “tangle” you even harder, I will introduce you an innovative approach to your presentations: SensorTag Wireless Presenter. What do we need for this novel approach? 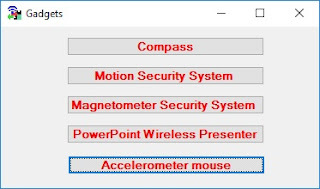 In the implementation of the wireless presenter, I have started from an application model in which the entire control of the PowerPoint presentation is from the blessTags environment. For example, with this concept deployed, the user no longer has to find in menus the PowerPoint application and then launch it. By simply pressing a button from the graphical interface of the blessTags this will be accomplished. The classic approach in which the presentation device buttons are associated with the PageUp and PageDown keys (and the user must make previously all necessary steps: launch the PowerPoint application, load the document and launch the presentation) will be developed soon. Pair your device (CC2541DK, CC2650STK, Thunderboard React or Thunderboard Sense) with the computer. Push the button “1. Refresh sensor tag” - in this mode the list of all paired BLE devices will be updated. Select the generic type of the device do you have – by selecting an option from the list “2. Select type of SensorTag:”. From the list “3. Select the specific device:” select the specific device with which you want to communicate. For example, you can have two Thunderboard Sense devices associated with your PC – at this step you must select with which one you want to communicate. Turn on the SensorTag device - an LED will start flashing on the SensorTag. Press the “Gadgets” button. A new window like the one below will open. Push the “PowerPoint Wireless Presenter” button. Now, the program that will operate your presentation control window (PCW) was launched. The user interface will be made through a panel like the one below. As you can see, no specific settings of each type of SensorTag are required, the blessTags environment will make all these settings for you. The user interface is very intuitive and as I have previously revealed only from here we will control the entire presentation. If PowerPoint is open, we need to connect to it using the “Connect to PowerPoint” button, otherwise we will press the “Start PowerPoint” button. To load or close the presentation, we will use the buttons: “Open Presentation” and “Close Presentation”. Now, in order to start the show from the first slide press “Start Slideshow” button. 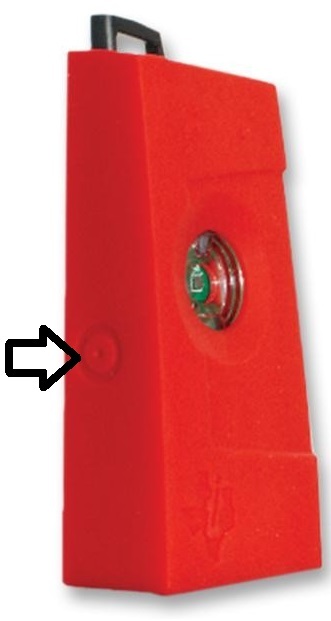 At this point, by pressing one of the two buttons on the SensorTag the show will go forward to the next slide or return to the previous one. By pressing the third button of the CC2541DK SensorTag or by approaching a magnet to the CC2650STK SensorTag, the presentation control window (PCW) will show up from background to foreground. So, now you can move freely in the auditorium up to at least 50 meters or 160 feets range, having the flexibility to move backward and forward physically on the stage and virtually controlling the presentation slides. Attention: for CC2650 the keys must be pressed less than 3-6 seconds! If you press the buttons longer, always you will get the following effects: (a) for the Power button more than 3 seconds: disconnect device and (b) both buttons more than 6 seconds: restore factory settings, i.e. apply the flash image that was programmed at production.